Check-in is 4:00pm MST and check-out is 10:00am MST. A Final Instructions email will be distributed to guests 7 days prior to arrival date containing check-in information, directions, and access information for the property. In most cases guests will access a property via a lockbox or resort lock. Early checkins can only be confirmed on the day of arrival. Download SkyRun's FREE mobile app to stay connected and receive valuable information about your stay in Nederland. Guests may access the details for their stay, such as check-in/out instructions, important phone numbers, property access information, Wi-Fi passwords, and instructions for using AV equipment and other electronics. While visiting Nederland, guests receive customized recommendations for nearby restaurants, activities and attractions and a map of the area. Download today and stay connected! Follow these steps to access the pre-arrival, property access, in-stay, and departure information. Compatible with Apple, Android, or computer. 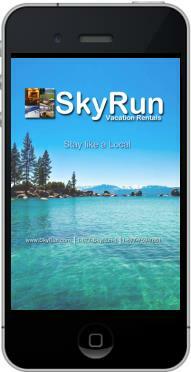 Click below to access the SkyRun Guest Portal or mobile app. Which local area got the most powder? Find out on your iPhone on this SkyRun app.